Gardening and preserving my own food is one of my favorite things in the world, but it’s also one of the hardest things that I’ve ever done. It takes a great amount of blood, sweat and tears to produce my own food and yet I do it year after year with much joy and anticipation. I do have moments where I’m sweaty and exhausted wondering why I don’t just buy my food at the store like most people, but deep down I know that gardening is ingrained in my soul and the benefits really do outweigh the hard times. So I created this list as a reminder to myself as to why I put so much effort into it. Enjoy! There are a myriad of reasons why gardening is good for my health: It provides an abundance of healthy, pesticide-free produce for me to eat, it gets me outdoors for my daily dose of Vitamin D, it gets my heart pumping and provides stress relief, just to name a few. 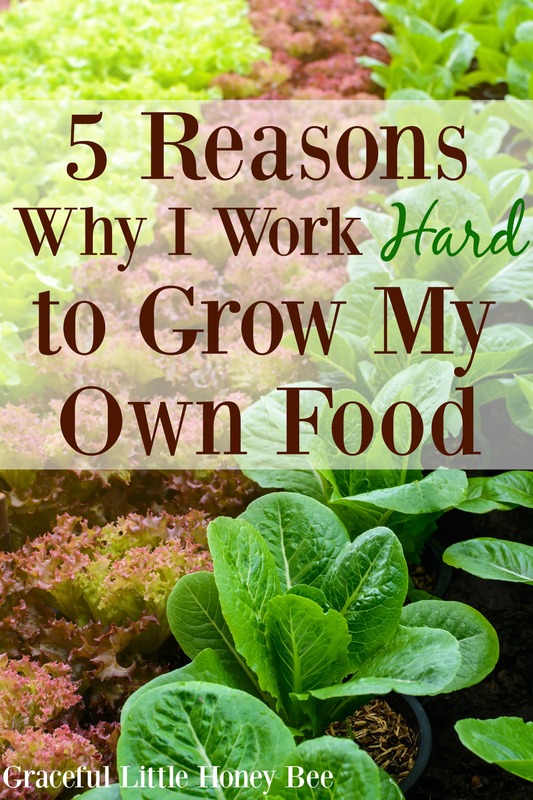 Growing our own food is also great for my family’s health because they’re eating TONS of fresh, pesticide-free food throughout the summer months and home canned and frozen vegetables throughout the winter. Also, we love to work in the garden together throughout the week so they’re also benefiting from being outdoors, working up a sweat and learning where food comes from. Growing and preserving our own food is a great way to lower our environmental impact. Every time I harvest fresh food from my backdoor instead of getting in my car and driving to the grocery store to buy prepackaged food that was flown in from across the globe, it’s really a gift to the next generation. Also, each time I open a jar of home canned goodies I’m creating less waste because I can reuse the jars and rings over and over again, unlike the one time use aluminum cans you buy at the store. There are investments that need to be made when gardening such as fencing, tools, seeds, etc., but when your food bill is almost cut in half during the summer and your pantry shelves and floor start to line up with food you can eat throughout the year, you’ll begin to realize just how economical gardening can be. The last reason I do the very hard work of growing my own food is that I believe we were created for it. The bible says, “The LORD God took the man and put him in the Garden of Eden to work and take care of it.” Genesis 2:15. Our creator put a need and a desire in us to create and work with our hands, including growing our own food. We were made for this and I believe everyone should at least try to grow something, even it’s just a basil plant on their windowsill. Much is gained from working hard and creating with our own two hands. I can't wait to have a garden someday to learn how to grow our own food too!